This Saturday was an extraordinary day for Honor Flights. 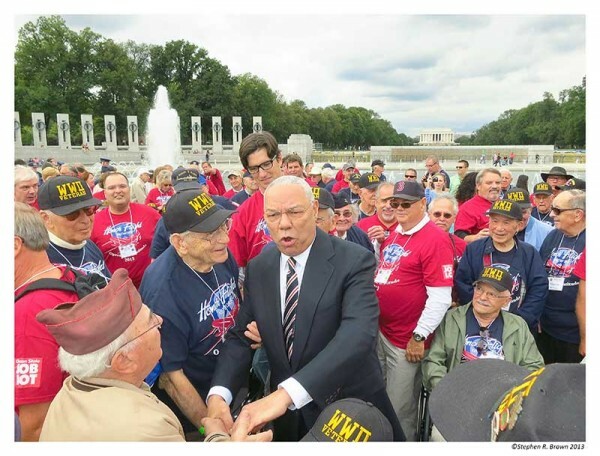 Hubs from Rochester, Columbus, New England, Rhode Island, Long Island, Space Coast (Florida) were all present as were Senators Dole and Colin Powell shown here surrounded by veterans. While there is already a picture of General Powell in the book, I might replace it with this one. Practice makes perfect! I am lobbying the Park Service to have my book WWII Memorial: Jewel of the Mall sold at the Memorial. More to come! I have put the images up on a folder in the Image LIbrary. As usual, downloading is only for personal use and for the veterans, their families and Honor Flight. Any other use requires written authorization. September 29, 2013 | Filed under About the Book, Blogs, Honor Flight, Photography, WWII Memorial.